Air University Admissions Fall 2019 Online Form for admission application and Fee Detail . 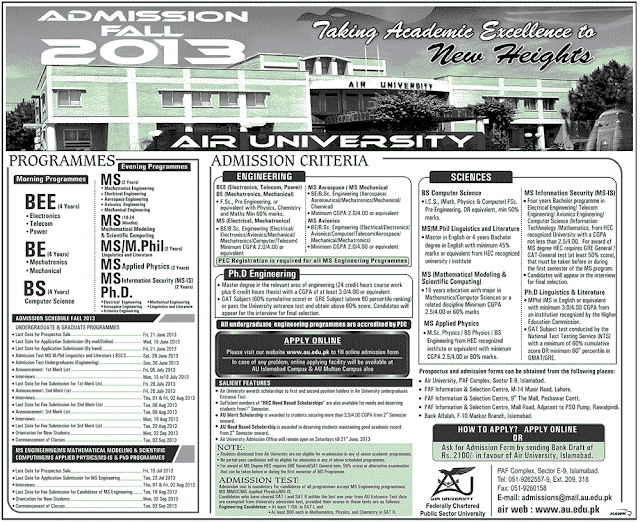 Air University offers admission classes for Morning and Evening Programmes. In morning programme admissions open for BEE(4 years), BE(4 years), BS(4years) & in evening programme courses are MS(2 years), MS/M.Phil, MS in Applied Physics(2 years) & PhD. You can apply online in Air University for Admissions through this add. It contains all the information that an interested and eligible candidate has need. Last Date for application submission is Wednesday 19th June 2013. Admission test will be on Sunday 30th June 2013. Item Reviewed: Air University Admission 2019 BS BE BEE MS Mphil Phd 9 out of 10 based on 10 ratings. 9 user reviews.